It's important to understand what nature gives you. How steep is the land? Where does the sun rise and set? Is there a view? What about wind, or flooding, or an unattractive view or unwanted noise? This project will require some unusual shading and screening strategies to minimize unwanted noise and bring in natural light. There's a busy intersection to be screened and the rising sun is shining directly along the length of the site in mid-summer. On the plus side of the ledger there are a couple of beautiful oaks, there's a winter view to the north, and the entrance from the road is nice and level. 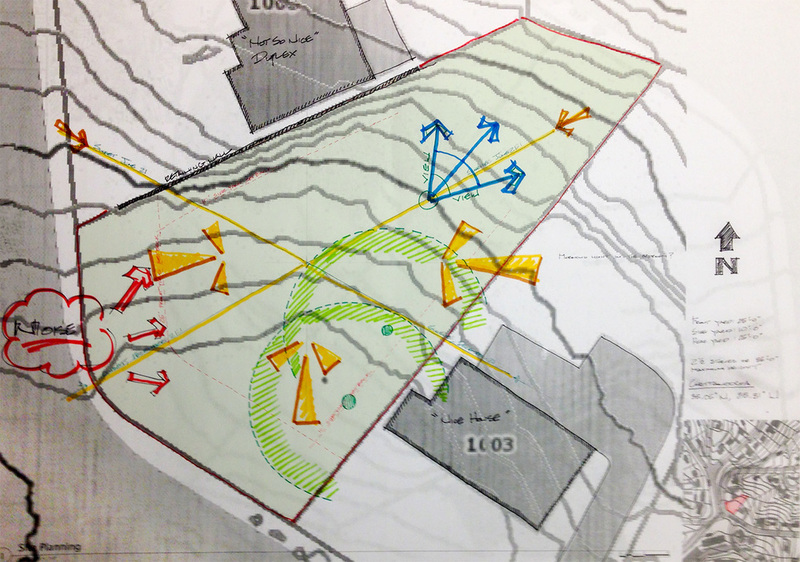 I map everything of interest, both good and bad, by hand over a topographical map of the project site. This gives me my first clues about where to locate certain rooms, and where and how to place windows. As soon as I have a working floor plan I'll refer back to my site analysis to be sure I'm on target with the project goals - minimizing unwanted noise or unattractive views while maximizing light, and balancing views, and privacy.